I was HONORED to be on “Never Give Up” – Stories of Ordinary People Who Have Experienced the Extraordinary. Definitely check out her podcast – it’s a whole series of interviews with people who, well…never give up hope! A little note about this art “I Can Hold On” – This was the second piece I ever created in Yale Hospital. It was a terrible, frustrating and frightening time. I remember ripping out each letter of “I Can Hold On” and collaging it onto the canvas. I didn’t believe I could, but I did hold on somehow. It’s not always easy – but it’s worth it. Listen to Carol’s podcast and tell me how you keep going! Do you know a survivor in your life? Someone that never gives up? Here are five ways I’ve learned to keep that hope alive. 1.) Try to see the good in circumstances. It wasn’t easy, but I found 27 positive lessons from 27 surgeries which you can read here. What is the opportunity in your obstacle? 2.) Try to see the good in others. This is an amazing rarely-seen TED talk by Victor Frankl – a holocaust survivor – on why we see the good in others. If he can, you can too. 3.) Scrapbook your rejections. Everything’s better in retrospect – or in a scrapbook. Check out these rejection letters sent to famous people. 5.) Take a break. And then start again. I’ve had times where I thought I’d reached the “triumphant ending” of my journey…just to land back in the hospital. Slips are okay. You can always get back on. Don’t be discouraged by little setbacks. Take a minute to catch your breath. And then try again. It’s easy to say “don’t give up”, right? Wrong. If you look back on the archives of this blog, you’ll see that even after my digestive system was miraculously reconstructed, I still had so many highs and lows on this detour – and it wasn’t such a beautiful detour at the time! Sometimes, I just didn’t want to go on. I like to draw with crayons when I’m feeling contemplative. I wouldn’t say it was a good four weeks. It was more like a good four months. But anyway, that’s the power of hope- it can get you through anything. You just have to keep going. Songs, art, tantrums, daydreams…How do you keep going? Just like the process of building up backgrounds…don’t ask when things will “get better” or “get prettier” or “be easier.” Just keep plugging along and trust. That is what I learned through this painting and though my life so far – not knowing where you’re going, but enjoying each step of the way. Sometimes we need a bit more help. I’ve put together a big directory of mental health resources, and feel free to add your own. And if you’re in college…well it’s hard keep going sometimes – I’ve got a special program just for you! How will you keep going today? Don’t forget to listen to Carol’s wonderful interview series! 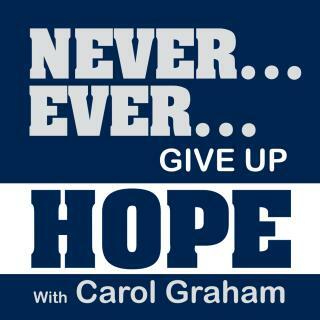 Listen to my interview on never giving up here. 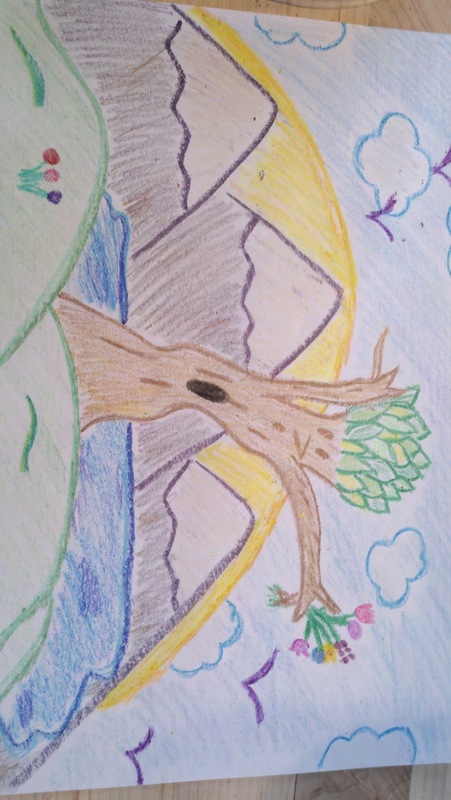 Your artwork is beautiful! As a special needs mom, I find myself wanting to give up sometimes. My kids are what keep me going. I hope that by letting them see me keep going when things get tough, that they will be inspired to do the same. love #5. So true! A break can do wonders in rejuvenating you! It certainly seems like you’ve had more than one person. Should have to endure. Choosing to remain hopeful & positive is a beautiful way forward. Thank you for sharing with us at Photo Friday! It’s amazing how when you find your passion and you truly live it out it’s not an option to quit. You enjoy it and you thrive from it. I have realized when I took out the performance aspect of things and really embraced just doing what I love to do it I gain more all around. It’s definitely not a race but a journey, a marathon. I try to be optimistic, even when it’s really bad. Honestly, if you lose that you lose it all. Wow thank you so much for this post! A really inspiring read! “Faith is taking that first step even when you cannot see the whole staircase.” I love that quote! Your graphics that you use are so cool – very great post!! Great round up of advice and I love all the quotes! Very inspirational! Very inspirational! Thank you for sharing! I just love how you use your experience(s) and seemingly impossible situations to inspire and encourage people. You are writing a beautiful story with your life. I really believe taking things a day at a time helps during bad days.. Great list. Love this post! Beautiful art! Love the stories behind them.